Right now Julie reckons we have over 45 meals worth of meat in the freezer, cooked and ready to heat and serve. No we’re not becoming Doomsday preppers. This is just a technique we’ve developed for making a meal in minutes – by preparing well in advance. One of our mainstays has been slow cooking large fatty joints of meat on the weekend, then portioning it up into Meals to be frozen. During the week we can take a bag of perfectly cooked and seasoned meat out of the freezer, thawing and heating it to serve in under 10 minutes. We can use each meat in almost as many different ways as there are Cuisines – whether it be an Indian Massaman curry or a Tex-Mex Chilli, or a Greek Souvlaki. This particular recipe we’ll take about 3 Kgs of Lamb Shoulder and your choice of aromatics (Spices and Herbs) and turn it into 15 freezer bags containing 200g of cooked shredded lamb. 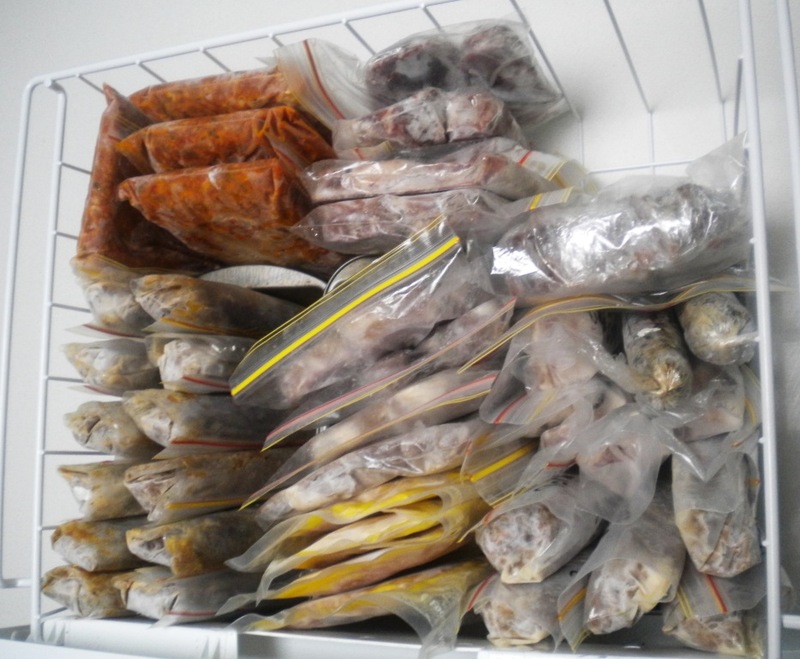 Below is the Meat Shelf in our Freezer – the Pulled Lamb is at the bottom left. All this meat is cooked perfectly then frozen and every one can be turned into a freshly cooked meal in under 10 minutes. 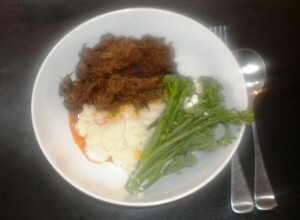 This bag of frozen pulled lamb can be simply reheated and added to a meal like this Lamb on a Cauliflower Risotto. 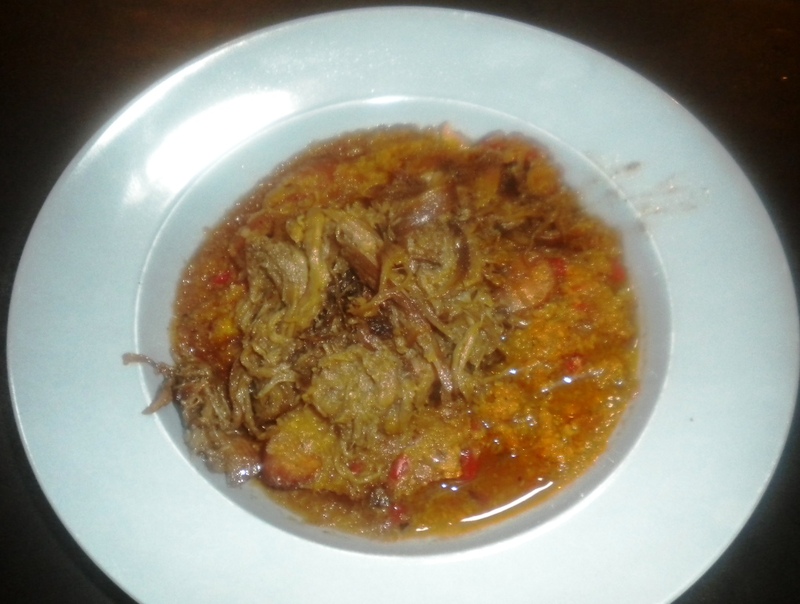 … or cooked up with some curry paste (commercial stuff that is lo carb is fine) and half a cup of coconut milk to make a Easy Lo Carb Lamb Rogan Josh. … or as the meat basis for Tacos. We use pretty much the same recipe for Pork Shoulder and Beef Shoulder to make pulled Pork and pulled Beef. The trick to slow cooking is to start with a little liquid in the bottom of the pot to stop the meat from initially burning. Eventually the fats in the meat will render out thanks to the slow low heat and this fatty sauce in the bottom of the pan will both protect the meat from burning, while serving to confit the meat and also provide an awesome fatty sauce for the final meat. You can use any liquid, Water, Stock, some people even use Diet Dr Peppers (but seriously people that’s disgusting). 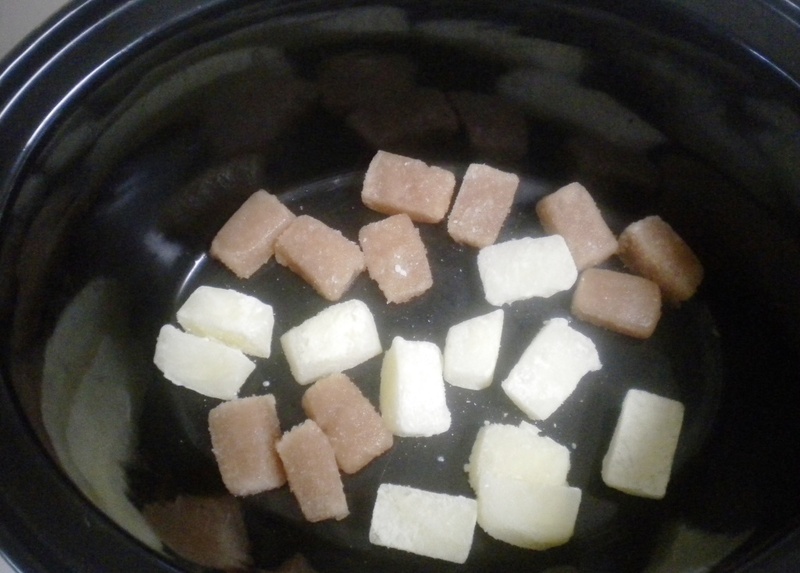 Here I have used chicken stock that I freeze in ice cube trays as well as Whey left over from making Cheese (also frozen in ice cube trays for long term storage). Next you’ll make a wet rub using a little Oil, Salt and your favourite Herbs and Spices pulverized up in a Mortar and Pestle or food processor. Rosemary of course is traditional for Lamb, as is Garlic – I’m using Powder because I had temporarily run out of fresh garlic. I also like using Allspice because it’s commonly used in Jamaican Jerk seasoning, but really you can use whatever aromatics you personally prefer. 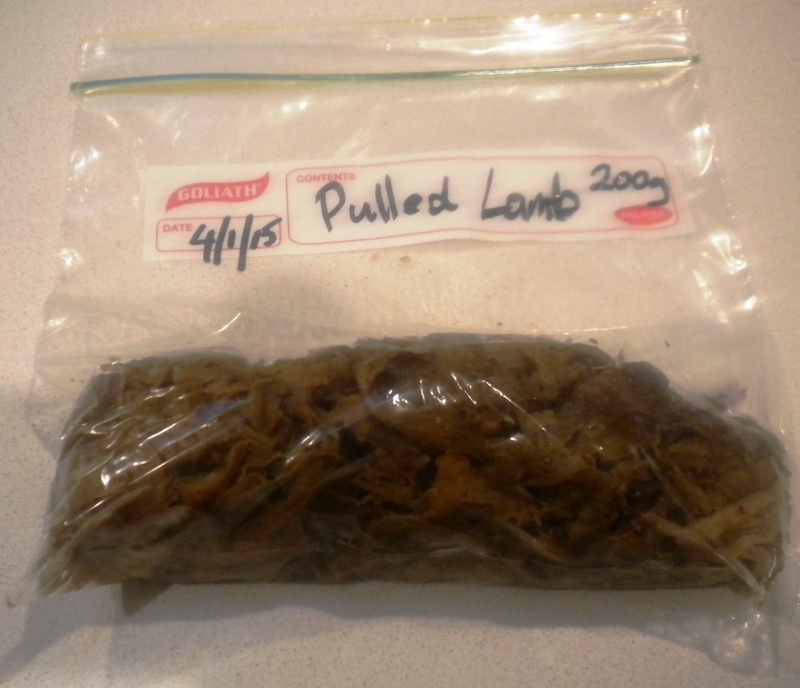 I would recommend keeping the flavour restrained if you will reuse this meat as the base in different cuisines. Lamb and Cinnamon works, strangely … but it’s not a great idea if you are planning to later use the lamb for Taco meat. 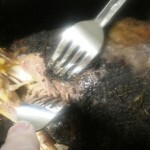 Then you just give it a low slow heat for a long time until the meat is just falling off the bone. 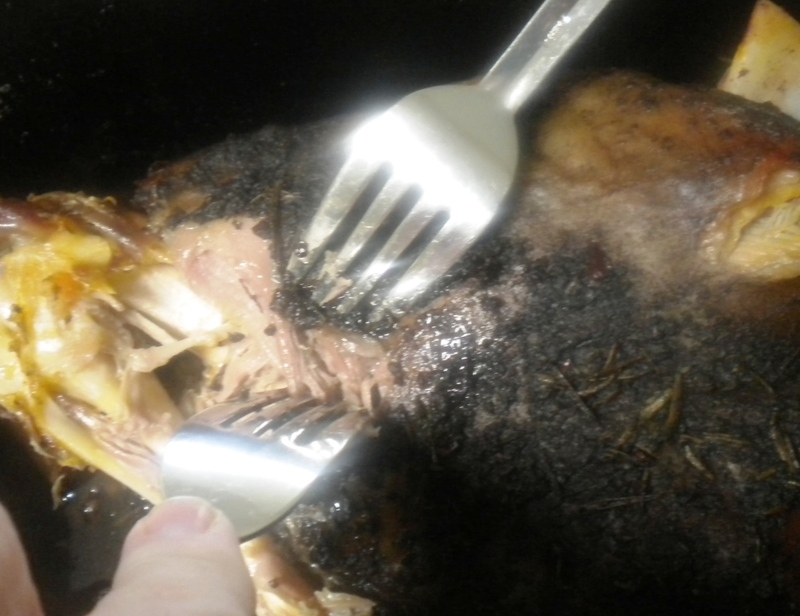 My cooker runs at about 70C on it’s Auto setting, and it takes about 6 hours to render down that shoulder joint. At the bottom of the cooker will be all the fat that has been rendered out of the meat, plus the stock, plus all the non fat juices that have escaped the meat. At this stage I just shred the muscle meat up using a pair of forks – and then cook it for an additional hour in the juices. Finally we portion our meat into meals – which for us is 200g. The easiest way I’ve found to do this is to put a soup mug on a kitchen scale and stuff a freezer bag into it – fill it to 200g (make sure to ladle in some of the Juices/Fat) and then push the meat to the bottom. Get as much air out before you seal it as you can to prevent Freezer burn. Grind all the aromatics in a mortar and Pestle - or just chuck them in a magic bullet and whizz them for a minute until you have a fine powder. 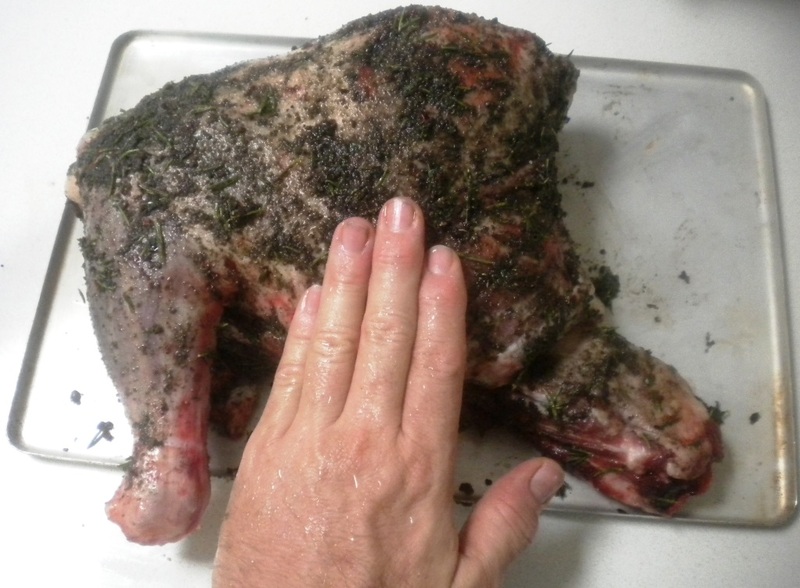 Add Oil to make a paste, and smear over the Lamb Shoulder joint. Put the 2 cups of liquid stock in the slow cooker. This is to make sure that the surface of the meat touching the hot surface of the slow cooker doesn't burn while you are waiting for the fat's to render out of it. 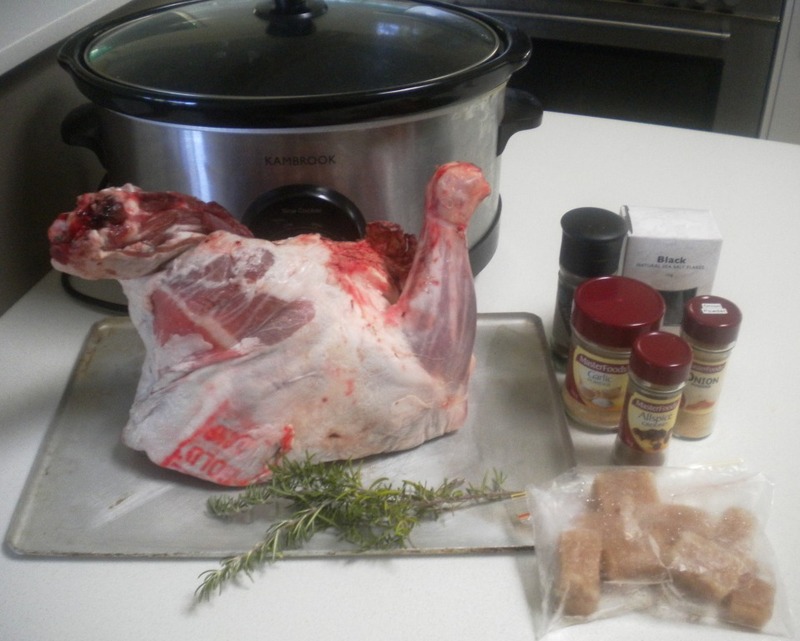 Put in the Lamb shoulder Joint and cook until the meat is falling off the bone. Normally this takes about 6 hours. Using 2 forks, shred the meat, and leave it to soak in the juices at the bottom of the pan. Cook for an additional 30 minutes to ensure any solid fat that you exposed while pulling the meat has rendered out. Remove the meat to a tray so you can separate and remove any bones, sinews and cartilage. 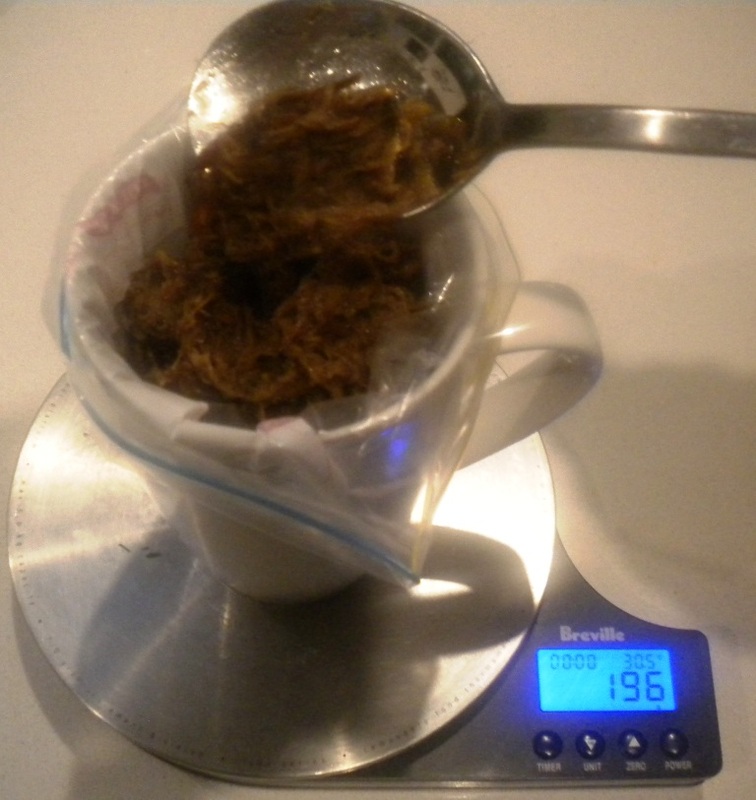 Place a cup on a kitchen scale and place a sandwich bag in the cup. Push the meat to the end of the bag and squeeze the air out. Defrost the bag in a cup of warm water, or remove the contents while still frozen and microwave it for 1 minute. Fry the pulled meat in a frying pan until it reaches serving temperature.